Driver’s bail set at $30,000Antonia Jacinto, 41, was killed around 11:15 pm last Thursday (Feb. 24) when a truck crashed into the bedroom of his home at 221 Tripp Street and Whilden Drive in Williamston. 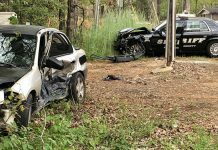 Jacinto was pinned to the bed by the vehicle and died of traumatic head injury, according to Anderson County Coroner Greg Shore. Shore said there were five children in the home at the time, and they were not injured. The mother was at work. Shore said it was a miracle that the children were not injured because one child was in the bedroom with the father when the crash happened. Austin Burdette, 19, of Belton was driving the truck and faces charges of felony Driving Under the Influence. 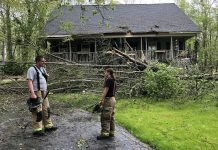 According to reports, Burdette was driving south on Tripp Street when his vehicle left the roadway in a sharp curve and crashed into the side of the residence causing the fatality. According to reports, Williamston officers responded and found the driver unresponsive in the vehicle which was inside the residence. According to reports the driver of the vehicle was removed and became combative and aggressively resisted officers when he woke up. He was detained and placed into handcuffs until the SCHP arrived. 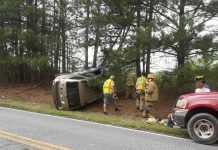 West Pelzer Fire Department, Pelzer EMS, South Carolina Highway Patrol and Anderson County deputies responded to the scene. In a hearing Friday, Judge Denise McCurry Malone set Burdette’s bail at $30,000. A preliminary hearing will be set when Burdette reports to the solicitor’s office on March 31. He faces up to $25,000 in fines and up to 25 years in jail if convicted. The bail hearing was held via a closed circuit link with Burdette in the Anderson County Detention Center. Civil attorney Tommy Dunaway has been hired by the Jacinto family, and addressed Malone as well. He said Burdette was so drunk that emergency responders “had to put the defendant into a wheelchair.” Dunaway said the family considers Burdette a threat to the community and requested that he be held without bail.